Relax with your honey and a glass of wine in our romantic courtyard. Book a room for this romantic weekend and we’ll help you book a romantic dinner in Sedona, and give you $50 towards it! Not only can we help with your dinner arrangements, but we can help with Sedona hiking trails, jeep tours, wine tours, train rides, a trip to the Grand Canyon, and more! We offer unique concierge services for Sedona and the surrounding areas. Once you return to El Portal, sit around the fire in our romantic courtyard. Each guest suite includes a private entrance, patio, fireplace, whirlpool bath, entertainment center with DVD and WiFi; featherweight cashmere blankets, luxury Egyptian cotton sheets and bath towels, premium down pillows and comforters for the ultimate in restful comfort. We may be a luxury boutique hotel, but we are a pet friendly hotel in Sedona. So if you have a dog, please bring her/him, we now have four rooms with enclosed dog yards! (Rooms 3, 4, 5 and 7). El Portal is a pet friendly bed and breakfast! 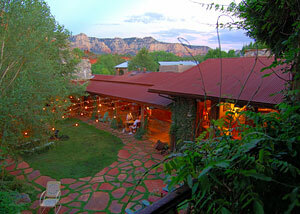 Surprise your sweetie with a Valentine’s Weekend at El Portal Sedona Hotel. Call now and say “Returning Guest Special” for this incredible offer. 1-800-313-0017.